While the Nation is settling into our usual routines and excitedly waiting for spring to come, there is one great American tradition that is nearly upon us; a tradition which unites us with a little friendly competition. We’re talking, of course, about SUPER BOWL 2017, everyone! In just a few days the New England Patriots and the Atlanta Falcons will take the field while families all over the country tune in to watch what promises to be a great game of Football! With the onslaught of fans that will soon be crowded into your living room in a rancorous and lively hurricane, wouldn’t it be nice to have a bit of help that you can depend on in the prepping department? Wouldn’t it be a blast to have an all-star line-up that, without fail, will make you the champion to your friends and family? Well, day-dream no longer, because there’s one other guest you can invite to your Super Bowl Party so that you can forget about breakage and dirty dishes. We’re talking about us, your friendly Fineline Settings serving ware! Sure, our name might be Fineline Settings, but that doesn’t mean that our products won’t play hard for you! 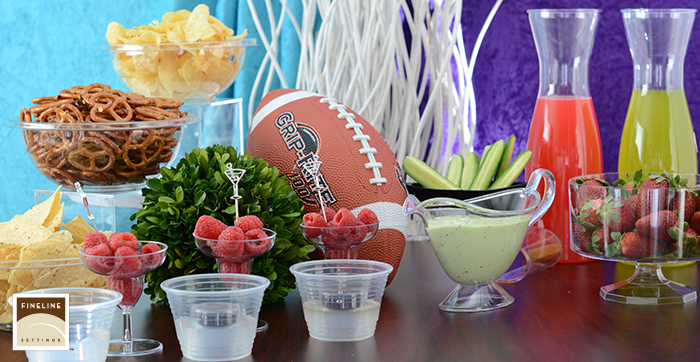 From our ever-expanding Super Bowls, Super Sips, Platter Pleasers and Savvi Serve collections, your game plan will go off without a hitch! 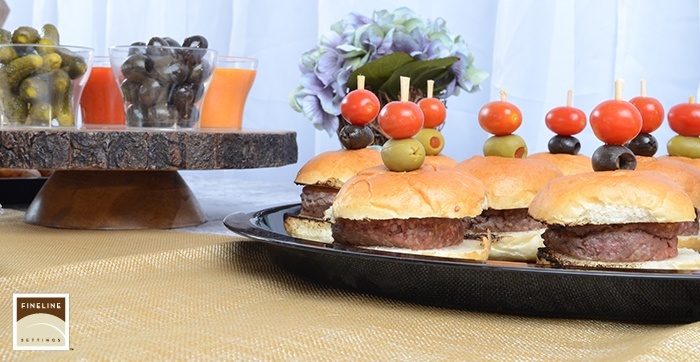 With our durable, dependable serve ware, you’ll never have to worry about a Field Goal resulting in a Fumble of broken glass all over the carpet! With so many sizes and styles to choose from, you’ll be a winner no matter what snacks and treats you choose to serve! Thanks to tight-fitting lids, even if the party isn’t in your living room, you’ll have a transport-ready arsenal of reliable and fashionable disposables that will keep cool and collected, even if your Falcon-Clad brother and your Patriot-Partying uncle can’t keep from butting heads! When the game is over, no matter which team comes out with the trophy, you can help everyone toast with our new Quencher’s Barware, and celebrate the wonderful people you’ve got on your team- without having to worry about broken glass or annoying after-party cleanup. We hope that your 2017 is treating you well so far. We here at Fineline are excited to serve your every need this year, and continue to expand and elevate your standards in Disposable Dinnerware!